To Caravaggio or To Not Carvaggio…that’s not the only question, by the way! Last season, I fell in love with the Burgundy Caravaggios. Aside from them being named after a Baroque artist Michelangelo Merisi da Caravaggio (sorry BUT Mr. John Fluevog, WHY not name a shoe after Artemisia Gentileschi, in my mind, the FAR more skilled and talented Italian Baroque painter but I digress), I was attracted to the sheer beauty and frills of the overall design. Not exactly kick off shoes (i.e., two mary jane buckles) but I have been eyeing them ever since. The bows are ridiculously feminine but, surprisingly, they look even better on. I highly recommend watching the bows. Make sure they don’t snag on anything AND if you have pets…KEEEP THESE SHOES away. The polygon heel serves as yet another unique feature. As for fit, they are comfortable but, technically, they are pumps and not heels. They won’t do damage on your back or wreak havoc on your feet. They fit true to size with a little room so consider getting a pad or half insole for the balls of your feet if you plan on wearing them all day. While they are comfortable (yadda yadda yadda, read the first paragraph), the new Spring color didn’t fly with me. When I tried the pink pair, I felt like…like I needed pantaloons and a mini-harpiscord at my feet with a powered white wig! There’s no denying the elegance and aesthetically pleasing design but with this shoe, color IS everything. But this particular shoe can easily make or break your outfit. Trust ME…if you know that your wardrobe cannot handle a lighter, pastel colored shoe, don’t do it. Stick with old faithful and get the black or burgundy in these beauties if you want versatility. If you have money to burn (trust me, I think the pink pair look amazing on Desert Vog aka The Addict), you may want to snag the lighter Spring color(s) of this design but be mindful of your wardrobe…PLEASE! That said…my next post will be on my new stilts…the Malibus! I know. I know…they’re knee high platforms and how practical are platforms? Probably not very practical BUT black and Silver are my power colors and they will help me save the world from utter art ignorance, shape and shift culture, and tons of other great things. Until next time, my Vog friends. Categories: FlueReview, Uncategorized | Tags: caravaggios, mary jane, pumps, spring collection | Permalink. Over the weekend, I managed to visit the Melrose store for the third time this month. That’s a lot for me since it’s an hour’s drive away! But my husband and I turned it into a fun little family outing, and we visited my mom for dinner afterwards. While I gushed over the new pairs that I tried on, he and our 5-year-old son (aka Mr. Destructo) hung out at the Johnny Rockets across the street noshing on fries and slurping milkshakes. Many thanks once again to the awesome Kate for indulging me during this visit! I think I’ve almost figured out which shoes I really want from the Spring collection (besides the Liz). I was also planning to try on the fantastic new 7th Heaven Angel styles (hello, polka-dotted oxfords and ankle boots!! ), but unfortunately they hadn’t yet arrived at the L.A. store. Once they do, you can bet I’m going to try them on and take photos! On this visit, I tried on a few styles requested by a couple of readers. Shirl has recently reviewed the Laura Evans, and you’ll get another review from Dorothy soon, but since everyone’s feet are different, the more reviews the better! In this post, I’ll be reviewing the Prepare | Guide, the River | Loire, the Baroque | Caravaggio, the Bellevue | Laura Evans (also reviewed by Shirl), and the Hope | Promise (also reviewed by J-Ro). Nota bene: what you should know about my sizing as you read my reviews. I am a true size US 5.5. I have relatively-flat arches, wide toes, and narrowish ankles. I wear 5 in the Operetta, Mini, Attention, and Bellevue families; 5.5 in the Fellowship family; 6 in the Radio and World families; and 6.5 in the older styles of the Miracle family. My other shoes are most often in size 6 but run slightly large on purpose (because they’re boots or ankle boots). Prepare | Guide in yellow. I have this style in the (still available) dutch blue from last year. I bought the size 6, which were a little big so I use insoles with them. This yellow pair are also size 6, but I’d say that they run slightly smaller than previous seasons — maybe not a half-size, possibly a quarter-size. These were still big on me; I’m probably a size 5.5 in these shoes. The spring colors are GORGEOUS. The turquoise has been almost-completely picked over, but it looks like they might be making more in the turquoise (there’s now a form on the shoe’s webpage to be notified when your size becomes available). I also like the pink, but I love this yellow. It went pretty well with my all-blues outfit that day. River | Loire in aqua and silver. This family runs narrow for me. I had to size up to a 6.5 to even get my toes through the toe strap. You can see that lengthwise it’s a little long at the top, but it’s not bad. These seem very comfortable, actually. On the profile shot, you can see a little “muffin side” going on there. For that reason, I’ll probably stay away from these shoes. This silver/aqua colorway is really striking, though. Hope | Promise in blue and cream. I saved the best for last here. This one was my favorite of all the styles I tried on that day. Thanks to J-Ro for inspiring me to try them on after her last FlueReview. I LOVE the colors and the cutout “f”s on the arch. I’ve long been a Hope family fan, but since the family runs true to size and the smallest size made was 6, the shoes were always too big for me. This style, however, comes in 5 and 5.5 as well. I tried on both the 5.5 and 6. While the size 5.5 fit well with my second toes touching the tip (like with the Liz), the size 6 proved a little loose at the heel. Kate said that I might consider getting the larger size in this style since they’d be perfect to wear in the fall as well with socks, which is an excellent point. Isn’t great how they’re so versatile? They’re cute enough to wear with skirts, as you can see in the photos, but I know I’d have no problems wearing them under pants, too. I have put this shoe in my current top three. We will see which pair I get next, if I can manage to buy another pair this season. 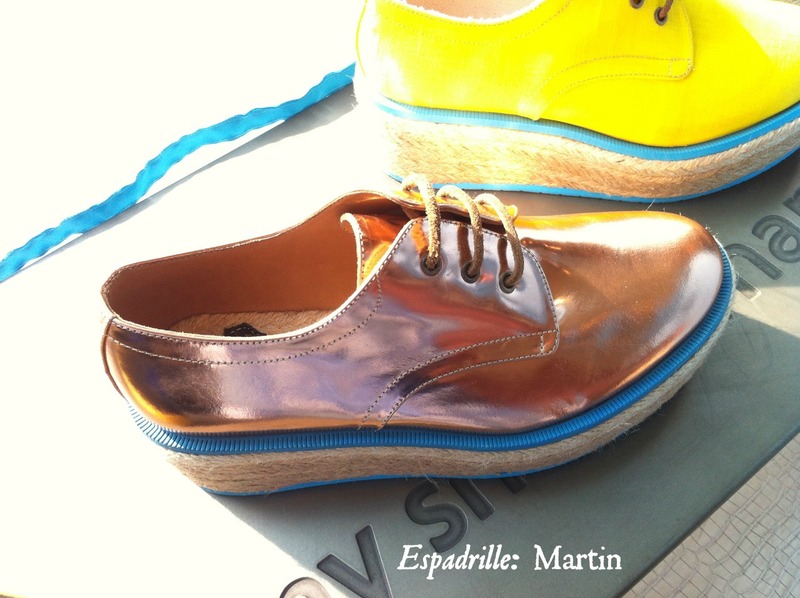 Espadrille | Martin in copper, plus the yellow next to it. These shoes still aren’t available on the website for some reason. But I wanted to show you a better photo of the copper colorway. Isn’t it awesome? Like I said in my last review, these were very comfortable. 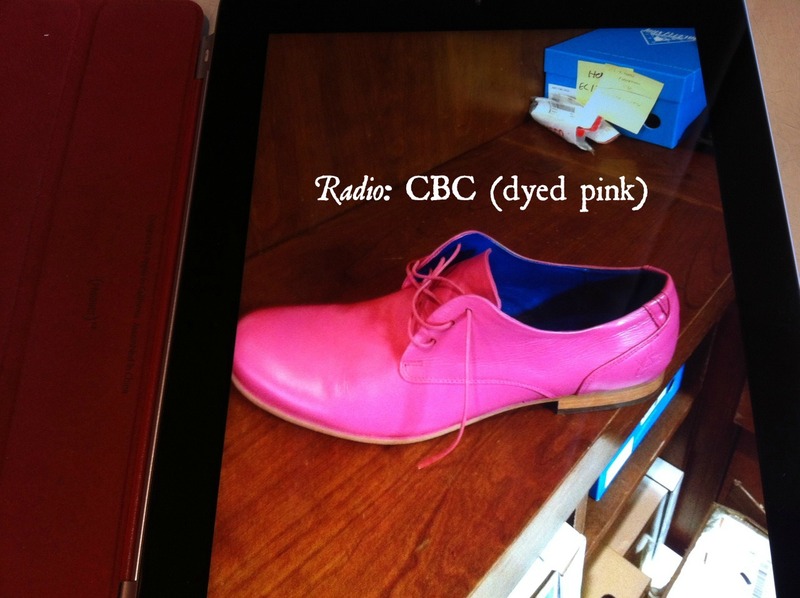 If you’re in the market for some interesting-looking oxfords and/or espadrilles this season, look no further! Before I go, here’s a “flower wheel” photo that I took with the wonderful Melrose dealers. 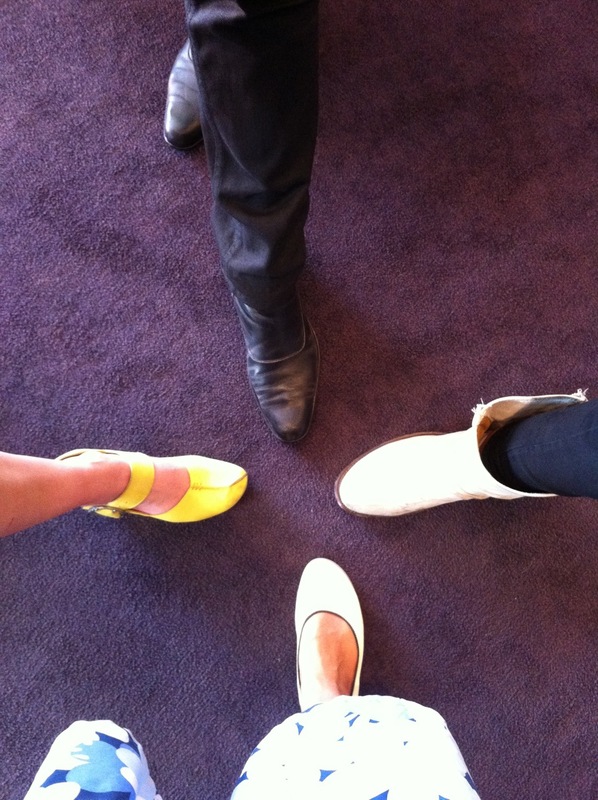 Counterclockwise from the left: Lenae wearing her yellow Prepare | Guides, Austyn wearing his black Twin Turbine | 1611 First Avenue boots, Kate wearing her white Living | Malcolm boots, and me wearing my cream Integrity | Amie flats. That’s it from me, fellow Vogers! I hope this was helpful in any way. Let us know if you have further questions about any of the shoes reviewed here. And also let us know what shoes you’ve already bought from the Spring collection, or if you’re planning to get any this season! They arrived from New York. You might remember the unfinished saga of the Liz from my previous FlueReview. Well, I got one of the best emails EVER from dealer Kate of Melrose on Tuesday (Hi Kate, if you’re reading this! 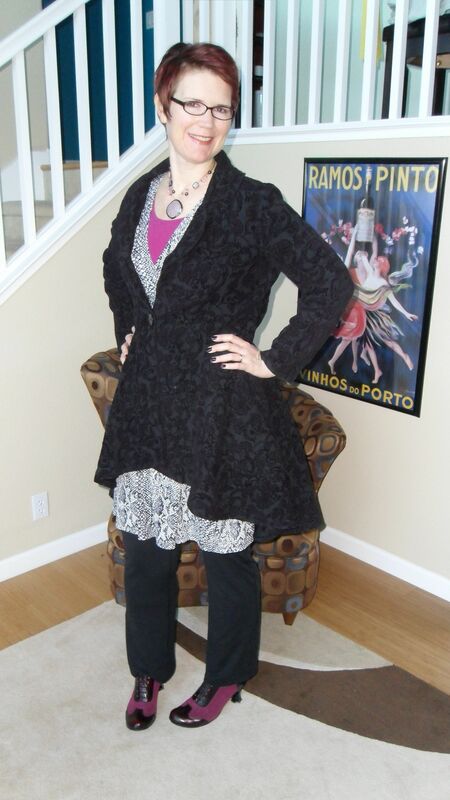 ), and a couple of hours later I was driving to the Fluevog store to try on the Liz. Once again, I was drawn to the Liz’s on display. They’re just gorgeous; true eye candy. For me, there’s something really special about these shoes, even with the embarrassment of riches that make up this Spring 2013 collection. Mind you, I was ready and willing to put a pair on layaway that visit. If, for some reason, the Liz came up short, there were other choices I would have been happy with. Like J-Ro, the Hopeful | Assured in camel was among my top 3 choices; rounding out the third spot was the Bellevue | Eleanor in pink. And I even had a fourth choice, the Presence | Imagine in aqua (yes, pointy toes!). Kate was (sweetly) concerned about the shortness of the toe box, that maybe my big and second toes were pressing too much against the tip. While I could feel the leather, my toes didn’t feel crunched in any way, and the rest of the shoe fit me well. We consulted with dealer Anthony (Hi Anthony!) who said that 1) the leather there would probably soften, and 2) if the break-in was too difficult, I could come back and have them stretch the area with the metal balls that they use for people who need to accommodate bunions. Sounded good to me! Another aspect of the toe box is that it is quite wide and spacious. When I tried them on, I noticed that there was space above my toes inside the toe box. We tried half insoles beneath the balls of my feet to close the space between my toes and the top of the toe box, and that did the trick. It was truly comfy after that, and it helped alleviate some of the pressure at the toe area. What actually worried me the most was the arch area. I’d been told by a fellow Voger who had the Liz in the same size that I might have a problem with my flat feet. However, I guess I have just enough arch for the straps. You can see that the straps are nice and snug in the above photos (they’re at the tightest holes). However, if the shape of the vamp in that area was too large, there was every chance the shoes would be too uncomfortable (with my feet sliding forward and putting all of the pressure on the toes). Thankfully, not the case. Sorry if that was too much detail for you guys! Moving on, here are the other Spring styles that I tried on while I was at the store. Munster | Beth in black and white. Even though they’ve been around for a while, I had never tried on any Munsters, simply assuming that they ran true to size and thus wouldn’t fit me (the size 6 being the smallest). However, the oxford style keeps my foot in pretty well. They are just really high, and with the shape of the heel, they require some practice walking so that I don’t look like I’m stomping everywhere. These are very striking shoes, especially this colorway. I love the orange shoelaces that the dealers put in. Unknown family or style. This new Spring style had just arrived at the store, and I didn’t write down the name of the family or style … it doesn’t seem to be available online yet, either, so I can’t tell you what they are. I apologize for that oversight! [ETA: J-Ro wrote in the comments that these are the Espadrille | Martin. She reads the newsletters closely!! Thanks, dear!] I can still review them, however, and these were surprisingly comfortable and really cute. Espadrille oxfords with matallic copper leather uppers and dark aqua accent … who knew? They’re my favorite of all the shoes I tried on that day (aside from the Liz). They look wholly copper in real life, but the photo shows how reflective and changeable they are in a certain light. These would be fun spring shoes, for sure. These were the smallest size (the size 6 I believe? ), and they fit perfectly. Rule Low | Joni in pink. Another gorgeous pink shoe. These are the size 5 and also seem too short. I’d size up to the 5.5 for the correct length, but again they are a little too narrow. Like the Rushmore, they have an open side that creates “muffin side” for me. I love that low stacked heel, though. I’m betting these would be really comfortable to walk in for long periods of time. Previously, I posted a review of the Vogs I tried on during my first spring break visit to the Haight Street store. Since I couldn’t get enough, I went back a second time and tried on a new batch Vogs! Many thanks to Ed for his warmth and kindness. I’d also like to send big hugs and kisses to Monika, who has been holding down the fort while FlueDaddies Denny and Jim are away. No matter how crazy things are, the Haight Street dealers always treat me like family. For that, I totally love them! Hopes: Promise. Let’s start with my new Wish List item. Hello Promise! Typically, they’re not something that would catch my eye. However, during visits to the Haight, I always ask the Manpanion if there’s anything he’d like me to try on. It’s fun to see what he’d dress me in. Confession: His selections aren’t always ideal. I once let him choose a few dresses for me to try on at the neighboring Bettie Page Store… (cough) Let’s just say that he will never choose my clothes. 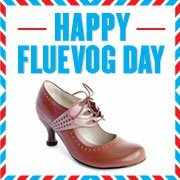 Fluevogs on the other hand, are a different story. He selected these because I don’t have anything like these in my collection. These are sized a bit small, so I went up to a 9.5. The blue and cream combo is really easy to match, and the low heel make this an all-day wearable Vog. Also, the cut-outs are great when you’re wearing a bright-colored sock. Though I was initially hesitant to try these on, I totally fell in love! It’s all in the details, I tell you. Great choice, Manpanion! Overall, I rate the Promise: a surprising find. These have been around for a while, but this color combo with the F-cutouts are so cute! Plus, you can’t go wrong with the comfort of this family:) The more I drool over them, the more I see the wardrobe possibilities. Pointy Begins: Woop Woop. Since I tried on the Mentors during my last visit, Monika brought out the Woop Woop to check out. Typically, they’re not something I’d be interested in. However, these immediately reminded me of John Travolta in Saturday Night Fever. If that iconic white suit were a shoe, the Woop Woop would be it! The tiny V-opening with the simple shoelace detail reminds me of a Johnny collar. Add the wing tip and these everyday flats sport some subtle flair. Just like the Postmodern Slushy, these pointy-toed shoes are friendly for the wide-footed gal. Unfortunately, I have extremely flat feet. Without arch supports, the Woop Woop look awkward on my feet. If you don’t have this problem, then these flats may be calling your name. They kind of remind me of a subdued Pilgrim. I can’t remember if I tried these on in a 9 or 9.5. Please call your favorite dealer for sizing info. Overall, I rate the Woop Woop: a comfy, everyday shoe that has some great details. The pointed toe does not emphasize a wide foot (an awesome surprise). However, a flat-footed person may need to think twice before investing in these. Either way, these are definitely an all-day, happy feet, kind of Vog. Provogs: One-O-One. I’m not typically a sneaker person. At some point in my life, I’m sure I owned a pair or two of Chuck Taylors because (1) I wanted to be cool and (2) I was trying to impress a crush. Other than that, sneakers are reserved for workouts or days when I know I’m going to be doing a lot of running around. When Monika suggested I try on the One-O-Ones, I figured I’d amuse myself. Besides, these are a Vintage re-issue and I’m all about playtime! Though these are not screaming my name, there are a few things one could really love about the One-O-Ones. The all-latex soles feel awesomely squishy. I’m loving the electric blue this season, and the bumble bee variation is cool too. (Yeah Transformers fans, I’m talking to you!) For those of you who have been looking for a street shoe, you may have found your match in these. I tried them on in a size 9, and they were really roomy (note: I wasn’t wearing any socks, so that should fix any fit issues). However, if you’re a half size, I suggest sizing down. Minis: Zaza in green and purple. A while back, I lamented on the greatness of the Zaza, and I still stand by that. The Zaza is not for the faint of heart. It’s a whimsical, Alice In Wonderland shoe, which means folks will either love or hate it. Regardless, they’re a Vog that people will always notice. The new green and purple colorway for the spring is no different. Though I have a no doubles policy, I wanted to see what the Zaza looked like. I’m in the market for some green and I wanted to see what I was missing out on. As with many of the other Minis, I take the Zaza in 8.5 (as opposed to my standard 9). The green on these is lighter and more pastel than on the Elif (which is more lime), and the purple detail is more grey than I was expecting. 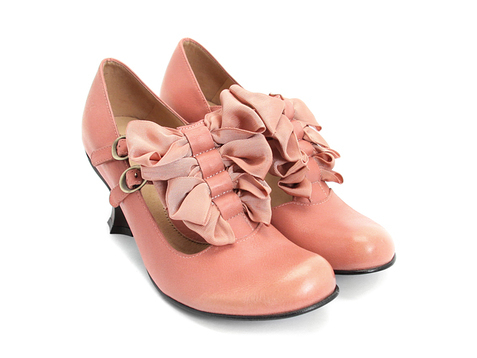 Alas, if you’ve been eyeing the Zaza, this spring colorway is gorgeous. Minis: Bee’s Knees. Oh Minis. How I’m a sucker for these! I’m a huge fan of the Momos, which are on my Vitange Wish List. However, for those of you who have come to accept that the Momos are gone, you may consider getting the Bee’s Knees. It’s a multiple-tone Vog with lacing on the side. Like the rest of the Mini family, the fit is fantastic! I tried these on in size 8.5, and they were great (odd because on anything boot-like, I usually opt for my usual size 9). Granted, you can never go wrong with the Minis. Thing is, I’m beginning to feel like my collection has an over-abundance of Minis. Plus, I have too much by way of color and style that would make these a neglected item if I did purchase them. Alas, a fabulous Vog, but my collection will have to wait for other color combinations. Overall I rate the Bee’s Knees: as fantastic as they come. The colors are great (I love the schoolgirl look of the black and white combo. The teal piping and laces are a great accent! ), and it has the signature Mini comfort. I hope to see this in other colors! Prepare Hi: Rappel. Madame Shirley texted a photo of these to me as a possible Wish List item. I opted out of trying them on during my last visit, but these babies just kept calling my name! The pink is a gorgeous spring color and the triangle cutouts are again, great for when you’re wearing a bright-colored sock underneath. As I mentioned before, my hesitation trying these on was my less-than-stellar experience with the Steady. However, I can now say that the fit on the Steady is just off. Period. It seems that the kinks were worked out with the Rappel because these fit great! The first thing I noticed was how LONG my legs looked! OMG! At just under 5’4″, these made me feel really tall and the heel was really steady and easy to walk in. (Note: The Manpanion was a concerned with my walk being a little off in these. However, I didn’t feel the instability.) At a size 9, these fit true to size for me. The only minor complaint is that the zipper was a little bothersome against my heels. With socks, I don’t think that’s a factor. Whew! I’m exhausted! One last thing I’d like to mention is the bags! Though I didn’t review them this time around, there are a few that I think are just outstanding! In particular, I’m impressed by the Prepare Pouch. The one wish I have is that the inner linings be light-colored, making it easier to find things. It’s the only thing that makes me hesitate to invest in a bag. Trying on the spring line was great! Though I’m not usually a spring person, after trying everything on, I’m really impressed! My spring picks are the Liz in black, the Promise in blue/cream, and the Assured in camel. Though I can’t quite afford all the Vogs I want, a gal can dream, right? Now that most of the spring and summer line has rolled out, what are your picks? Please post to comments! Confession: A few months ago, the Haight Street dealers gave a few members of the MotleyFlue and friends a small sneak peek at the spring 2013 offerings. While there were various ooohs and aahhhs that came about, my first instinct was to hold back. Generally, I’m not a spring person. I love color, but I’m more interested in the deep, rich colors of fall. Also, I never really know if or how much I like a Vog until I actually try it on. For those of you who order strictly via the internet, hats off to you, as I would totally be lost in making those decisions! Before I continue with my FlueReview, I’d like to mention a few things. First, different strokes for different folks. What I like isn’t necessarily what you like (and vice versa). I’m okay with this, and I hope you’re okay with that too. For reference, size 9 is what I consider my baseline size (as it’s what I usually am). From there, I go up or down depending on what kind of shoe I’m buying and how a company or style is sized. I have really flat feet (in running shoes, I opt for a double wide width) and possess Morton’s toe (actually, my condition is even stranger than Morton’s toe because my second and third toes are longer than my big toe). I have typical island-style legs, which means they’re thick all over. (In fact, I’m thick all over. Therefore, a stable Vog is important to me.) Okay. Enough about me. Here are some pics and notes from my most recent visit to the Haight Street store. Many thanks to Monika and Rachel, the lovely dealers who helped me. You ladies rock! Truth be told, Fluevogs are pretty much the only shoes I wear. The only exceptions are the occasional casual slipper or workout/running shoe. About a year ago, I decided that I’d put my collection to use and wear Vogs on a daily basis. With that, I also decided to build a collection for everyday use. This is why I was drawn to the Mentor. Since I have a no doubles policy, my heart is slightly broken because I won’t allow myself to purchase any of the Guides in the gorgeous pastel colors they now come in. Granted, the Mentor is nothing like the Guide. However, the Mentor does have that slight curve at the top and it comes in this lovely aqua color. These are a great daily flat, are comfortable, and are super practical. I had to size up to 9.5 in these. Even then, they were a little snug, but I figured they would eventually break in nicely. They are really flat, so admittedly, they look a little off with my super-flat feet. While they are not at the top of my wish list, they are a great shoe. Note: These are not Manpanion approved. I can’t even describe the sourpuss face he made when I asked Rachel to let me try them on. Overall, I rate them: nice to have; will add to my collection if the price and need are right; you should try them on because you’d be surprised at how much you’d like them. There are a few important notes I’d like to make. First, these are sized quite large. I tried them on I size 8 and they fit really well. I did notice that my left foot fit a little more snug than the right, but that’s easily fixed with minor stretching. If you’re opting for these, I suggest going down a size. Second, the pointy top is pretty much empty space. This means that minor adjustments on how you walk will need to be made. Otherwise, you might find yourself tripping over yourself. Note: I’m clumsy, so that last warning was for me:) Third, though they seem high, I was surprised at how comfy they were. I could barely tell I was walking on a heel. Finally, I’m not a fan of the pointy toes because they emphasize how wide and flat my feet are. Of course, Mr. Fluevog would know how to make a pointy toed shoe that doesn’t emphasize wide feet. While the distinct toe and open window sides make this a fantastic Vog, the Postmodern Slushy just isn’t me. They’re gorgeous and unique, but I don’t have the personality or wardrobe to pull them off. For someone who does have the personality to pull this off, these are a total gem! Overall, I rate them: absolutely gorgeous and unique; surprisingly comfortable and fashionable, even for the wide-footed; if they’re you, jump on the NOW because I’m not sure how long they’ll last. After trying on the Steady and not really felling the Fluegasm, I wasn’t really interested in checking out the Spur. The Steady had a really odd fit and I was expecting the same with the Spur. However, when Monika (dealer extraordinaire) described them as “Jem shoes,” I couldn’t help but be transported my 80s childhood, where I spent mornings watching the popular cartoon. The geometric shapes, bright spring colors (as a kid, I loved the pink/purple/turquoise combo), and cartoon nostalgia (I’m also thinkin’ My Little Pony) make these irresistible. Much to my surprise, these fit a lot better than the Steady and were more comfortable too! I typically have to go up half a size to 9.5 in this family. Yes, these babies made me feel “truly outrageous” and are Manpanion approved. However, I can’t really think of anything in my wardrobe that would do these justice. Overall, I rate them: a must try-on; perfect for spring and gives you a sense of nostalgia; very comfy and secure when on. Overall, I rate them: a simple Vog that can pretty much go with anything; gorgeous details; an all-day comfy shoe! The Rushmore was the definite surprise for me. I learned the hard way that I’m not really a clog gal. They’re heavy and hard to walk in (don’t get me started on the disaster that resulted in trying on the Halfmoon). Therefore, I wasn’t really interested in checking these out. However, since I’m in wedding planning mode, all I could think of is how these were “something new” and “something blue.” With that, I asked Rachel to bring these out for me to try on. Much to my surprise, they were light and easy to walk in. I’m clumsy and can trip easily and these were nice and steady. Given the platform, I can see how these are an all-day shoe. In the store, I tried on a size 9, which fit well. However, in looking at these photos, I see that the foot bed is a little short. I’ll have to go back and try on the 9.5. For now, I think these run true to size. Yes, these are on my wish list. Overall, I rate them: a comfy clog that’s easy to move in; an all-day Vog; gorgeous color! It seems that the Liz is the hot Vog of the season, and I’m not here to tell you differently. It really is amazing! They took a simple mary jane and coupled it with a re-tooled Wearever heel to create something sensational. Note: I’m not a Wearever person. I lean toward larger, chunkier heels like the Minis. This is why I wasn’t sure if I’d like Liz. Also, after last year’s International Fluevog Day, I issued a ban on black shoes in an effort to spruce up my collection. However, the details on this are divine! How cute is the hot pink F-sole and the white trim?! (Ahem. Very.) In terms of sizing, most people are going up half a size. For me, I needed to go up a full size to a 10 because my toe kept hitting the top in the 9.5. They’re (dare I say) more comfy than the Minis (because of the lower heel), but equally steady. I can’t wait to see what else they develop in this family! These are #1 on my wish list. In fact, the Manpanion immediately asked me how much they were and if I was going to put them on layaway. It’s rare for him to get that twinkle in his eye when I try on shoes, so that should tell you how incredible these Vogs are! I could swear he was almost ready to buy these for me:) Alas, my size was out. Overall, I rate them: a MUST have! If I saw someone wearing the same exact Vog, I’d give her a high-five for impeccable taste! This is a Vog that anyone could fall in love with. In fact, Liz in black may be the one Vog that all four members of the MotleyFlue possess. Only time will tell. Thanks for you time, everyone! If there is a specific Vog you would like the MotleyFlue to rate, please don’t hesitate to email us at fortheloveofvogs@gmail.com. We’ll do out best to give a full and honest review. Time for another FlueReview! Actually, I should have visited the Melrose store at least a month ago, when the Spring collection was being rolled out. Why? Because my sizes in my most-coveted styles and colorways are flying off the shelf. In a couple of cases, they’re completely gone already. The Liz in teal? Gone in both 5 and 5.5. The aqua Assured sandals? Also gone in both 5 and 5.5. Nevertheless, I was still able to try on a lot of exciting shoes over the weekend. This post is going to be a little photo-heavy, so bear with me. Let’s get down to the nitty-gritty reviews, especially on sizing. What you should know about me before I start: I am a true size US 5.5. I have relatively-flat arches, wide toes, and narrowish ankles. I wear 5 in the Operetta, Mini, Attention, and Bellevue families; 5.5 in the Fellowship family; 6 in the Radio and World families; and 6.5 in the older styles of the Miracle family. My other shoes are most often in size 6 but run slightly large on purpose (because they’re boots or ankle boots). The most notable new families this past Fall and this current Spring season seem to run true to size, such as the Hopeful, Integrity, Big Presence, and Kitschy Kitschy Boom Boom — although the current season of the Integrity ballet flats runs small. Integrity: Amie in gray and orange. I have a pair of Amie flats from the Fall line in size 6, and they are large on me (I wear them with socks). However this size 6 pair of gray/orange Amies from the Spring line fit me wonderfully. I’d say they’re running half a size small this season. I recommend the Amie style in general. Comfortable, durable, and lovely. Integrity: Arabella in black and ivory. The first time I saw a photo of the Arabella flats, I had a frisson of excitement for the Spring season. I love the brogue and ballet flat mashup. They are so elegant, and I’d say they’re built like the Amie. Comfort and delicious style in one. This pair was also in size 6 and fit me perfectly. Like the Amie, they’re a half size small. Radio: BBC in purple suede. If you didn’t know, I’m a Radio fan. I love these purple ankle boots (size 6; Radios run narrow so the 6 fit me just fine), but I already have another pair of purple suede Radio boots, the PRI. I just wanted to try these on, and I wasn’t disappointed. If they weren’t suede, I would have seriously considered them. Hopeful: Assured in black. This pair that I’m wearing is a size 5. While the left shoe fits just right, there is a bit of toe-overhang on the right foot (which I dislike greatly). Like most people, I have a foot that’s larger than the other, in this case the right foot. Dealer Kate at the Melrose store suggested I size up in these (and also that I take off the stockings so that I could get a better fit). Hopeful: Assured in camel. Here are the Assured in size 5.5. The left foot is a little loose at the heel but the ankle straps hold me in pretty well. If I bought this style, I would get the 5.5. Aren’t they gorgeous? I originally thought I’d get the black pair, but the camel color is much more versatile for spring … plus the triangle cutouts look much more striking on the camel. Between true to size and half-size large. Hopeful: Cheerful in aqua. In general, the Hopeful family is — for me — one of the more exciting new families in Fluevogdom. These oxfords on my feet were size 6 and ran a tad large, although I could probably wear these well with socks. (Who wants to wear socks with spring shoes, though?) This style is thus true to size. I think I’m in love with this aqua color, as you’ll see in the other shoes below (it’s more a turquoise, though, don’t you think?). Bellevue: Eleanor in pink. This style was a surprise for me. First of all, I preferred the size 5.5, when I expected the size 5 to work. 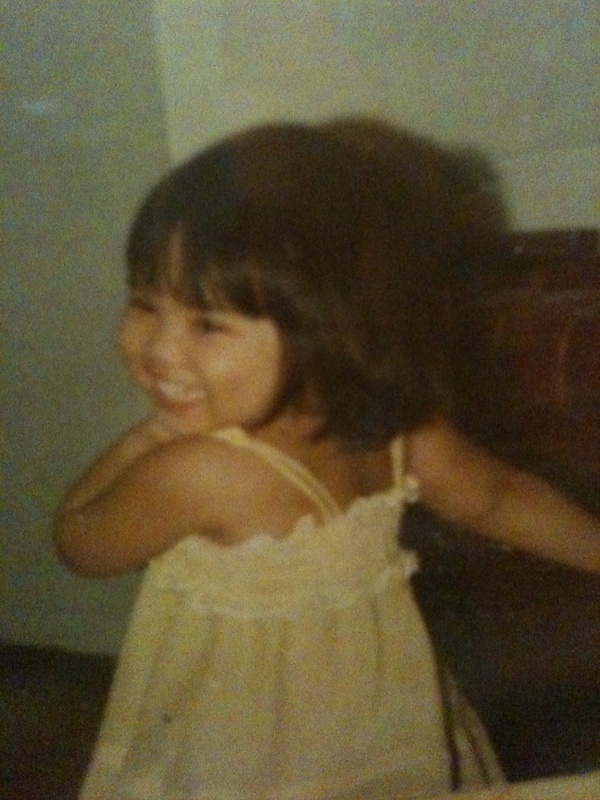 (I’m a size 5 in earlier styles of Bellevues.) I tried the 5 in the black colorway (which wasn’t that exciting, especially since I recently got a pair of black Paris pumps in black), and it fit a little too snugly at the toe box. The 5.5 size fit perfectly, and the pink made me really happy. The two-tone colorway and the flowery art deco detail at the heel seriously worked for me. Gorgeous spring shoes. True to size. Desire: Mentor in aqua. I believe Desire is a completely new family this Spring (please correct me if I’m wrong). They’re not particularly wow-them shoes, but I am drawn to them nevertheless. I was talking to Kate and she and I agreed that they’re perfect lounge-and-errands shoes. They sort of look like house shoes, given the loafer style, but can and should be worn outside for a little extra style. I call them stylish suburban mom shoes. Um, that doesn’t sound too appealing, does it? But they felt reeeaaallllly comfortable. These are size 6, so they run half a size small. Kitschy Kitschy Boom Boom: Liz in black/pink/white. Finally, we come to the Liz. Oh, Liz Liz Liz. This is the biggest reason why I should have visited Melrose much sooner than this, if only to try them on. THIS was the pair that I was really hoping for. (And there was something cool about buying two different pairs of shoes in back-to-back seasons with basically the same name, Elizabeth and Liz.) If they didn’t fit the way I wanted, oh well, there were other fish in the sea, but I at least wanted to see how they fit. Unfortunately, by the time I arrived, ready to put my favorite pair of the season on layaway for my upcoming birthday, the smallest size available in the Liz was a 7.5, which is what is on my foot in this photo. Far too big, obviously. (And the only sizes left in the teal were 10 and 11!) I couldn’t possibly decide to put any of the shoes on layaway without knowing if I could fit the Liz. Seeing my distress, wonderful Kate said that she would call the New York store to see if they could transfer the size 5.5 to Melrose so that I could try them on. (She and fellow dealer Anthony surmised that I was probably a 5.5 in these shoes because of the small toe box.) I found out today that YES! the NY store agreed to the transfer, and so I will be visiting the Melrose store in the very-near future to try them on properly. I will post an update on that when it happens. Can I give a big shout-out to my Melrose dealers? Kate went above and beyond on this! Plus she’s generally awesome. To sum up, the Spring 2013 line has been particularly spectacular … and this is after a fantastic Fall 2012 line. I’ll be the first to say that last year’s Spring shoes didn’t make my heart beat that fast. I still bought some beautiful shoes last year, of course, but I was close to getting some Fluegasms trying on LOTS of shoes this past Saturday. The amazing colors! The adorable styles! Who’s with me? Big Presence: Desmond in yellow — Size 5.5, true to size, and super stylish. These would be great for the office, actually, in mid-summer. If I had an office job, that is. Rivers: Loire in black and bronze — These run WAY too narrow for the base of my toes; I couldn’t even get them on in the size 6 (which was the correct size for foot length). However, if they fit you, they’re really gorgeous, especially in the aqua and silver colorway. ‘Til next time, fellow Vogers! Oh Rayelle (size 9-9.5), one day you and I shall meet. So… what’s on your Vintage Fluevog wishlist? Categories: Hot Vog Find, Uncategorized, Wish List | Permalink. A few months ago, we met Laina, who was spotted at the Oakland airport in a gorgeous pair of Bunnies. Shortly after, she kindly shared her story with us. Today, Laina shares some pointers on how to sport your Vogs at work. Again, many thanks Miss Laina. Your outfits are adorable! One day, we expect to see you featured as a Vogunteer! 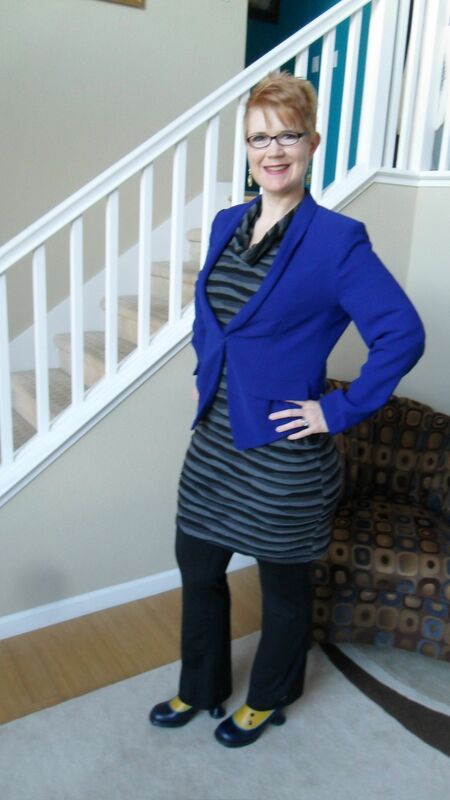 Check out Laina’s tips for putting together Fluevog outfits for work! This year I decided to up my game at work. Even though casual attire is completely standard at my workplace, I have a lot of nicer clothes in my closet and I want to wear them! Fortunately my Fluevogs are perfect companions in my new endeavor and they’ve been getting a lot of wear. My Vogs tend to get a lot of notice and compliments when I wear them to work, and I wear them often enough that several of my coworkers are now familiar with the brand! Usually I start with a color and try to put together an outfit with one or two main hues that play off of my Fluevogs. 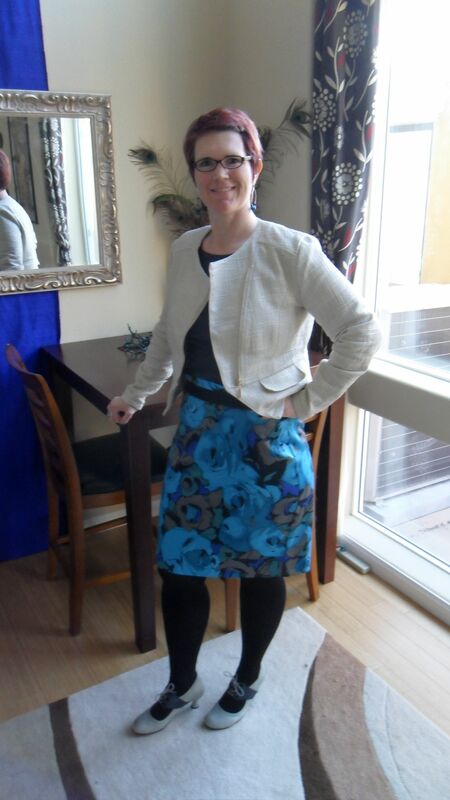 A pretty patterned pencil skirt, gray top and funky white jacket pull together the right elements to go with my Mollie Johnsons in blue and grey. For my Baroque Cortonas I found all I needed was a splash of pink and a bold necklace. I like long coats with shaping at the waist for the office because they keep me warm in the AC environment and are flattering to my pear-shaped figure. Sometimes I start by deciding which pair of Vogs I want to wear and build an outfit around them. For example, my blue and yellow Mini Bunnies can be a challenge, as they aren’t traditional heels, so wearing them with nylons or tights can sometimes feel a little clunky. But, I’m an unrepentant dress-over-pants wearer, and with a pair of yoga pants (so comfortable!) they work great. (So far nobody has called me out on wearing yoga pants to work!) I like to wear them with a blue blazer and a stripey dress – this dress is too short and snug for me to feel comfortable wearing to work without pants, but with this outfit it takes on the role of a tunic. I’ve worn these shoes with blue, yellow and teal as the main colors in my outfit and they work with all of them. One interesting phenomenon I’ve noticed when wearing the Mini Bunny – women invariably LOVE them and tell me so, and men seem to be confused by them. They aren’t sure whether they like them or not, and they can’t quite tell if the shoes should be considered weird or outlandish – or maybe perfectly normal! My red Operetta Illeanas are the foundation to my husband’s favorite outfit of this set – he loves red and black together, and I can’t say I blame him! 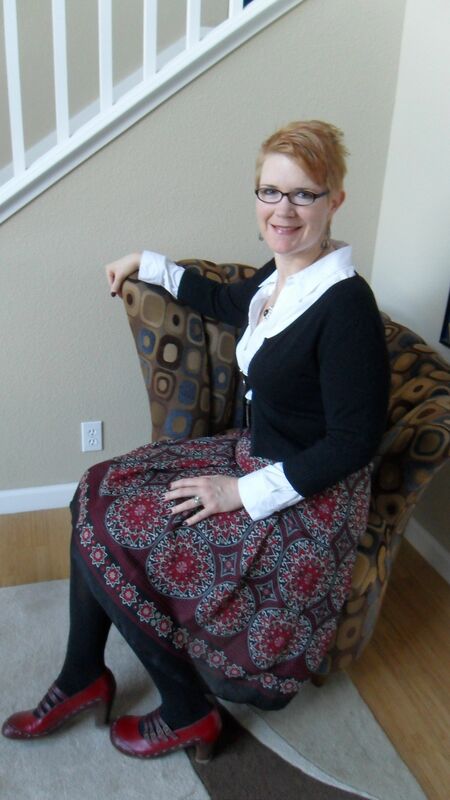 I picked up this skirt at a thrift shop, and pair it with a white collared shirt and black sweater. These shoes are easy to style with almost any skirt, dress or pants. They probably get the most workday wear of my Fluevog collection. P.S. Yeah, I totally dyed my hair blonde halfway through the week!